A cleanroom or clean room is an environment, typically used in manufacturing, including of pharmaceutical products or scientific research, as well as aerospace semiconductor engineering applications with a low level of environmental pollutants such as dust, airborne microbes, aerosol particles, and chemical vapors. More accurately, a cleanroom has a controlled level of contamination that is specified by the number of particles per cubic meter at a specified particle size. To give perspective, the ambient air outside in a typical urban environment contains 35,000,000 particles per cubic meter in the size range 0.5 μm and larger in diameter, corresponding to an ISO 9 cleanroom, while an ISO 1 cleanroom allows no particles in that size range and only 12 particles per cubic meter of 0.3 μm and smaller. Cleanrooms can be very large. 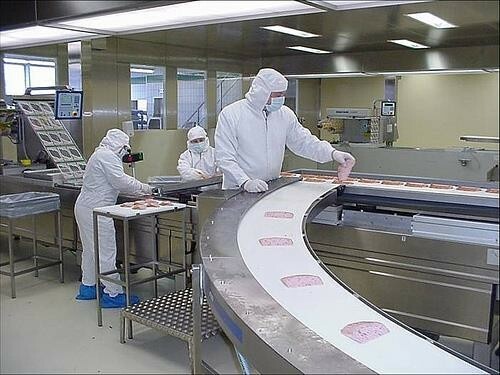 Entire manufacturing facilities can be contained within a cleanroom with factory floors covering thousands of square meters. They are used extensively in semiconductor manufacturing, biotechnology, the life sciences, and other fields that are very sensitive to environmental contamination. There are also modular cleanrooms. The air entering a cleanroom from outside is filtered to exclude dust, and the air inside is constantly recirculated through high-efficiency particulate air (HEPA) and/or ultra-low particulate air (ULPA) filters to remove internally generated contaminants. Staff enter and leave through airlocks (sometimes including an air shower stage), and wear protective clothing such as hoods, face masks, gloves, boots, and coveralls. Equipment inside the cleanroom is designed to generate minimal air contamination. Only special mops and buckets are used. Cleanroom furniture is designed to produce a minimum of particles and to be easy to clean. Common materials such as paper, pencils, and fabrics made from natural fibers are often excluded, and alternatives used. Cleanrooms are not sterile (i.e., free of uncontrolled microbes); only airborne particles are controlled. Particle levels are usually tested using a particle counter and microorganisms detected and counted through environmental monitoring methods. Some cleanrooms are kept at a positive pressure so if any leaks occur, air leaks out of the chamber instead of unfiltered air coming in. Some cleanroom HVAC systems control the humidity to low levels, such that extra equipment (“ionizers”) is necessary to prevent electrostatic discharge problems. Low-level cleanrooms may only require special shoes, with completely smooth soles that do not track in dust or dirt. However, for safety reasons, shoe soles must not create slipping hazards. Access to a cleanroom is usually restricted to those wearing a cleanroom suit. Delvalle has a wide range of cabinets of stainless steel ideal for cleanrooms. We also have a range hygienic cabinets to achieve the requeriments highest.